I am starting from square 1 to build the latest acronis B&R 11.5.37678 script. I am doing my best to gather all neccessary info to create this script. 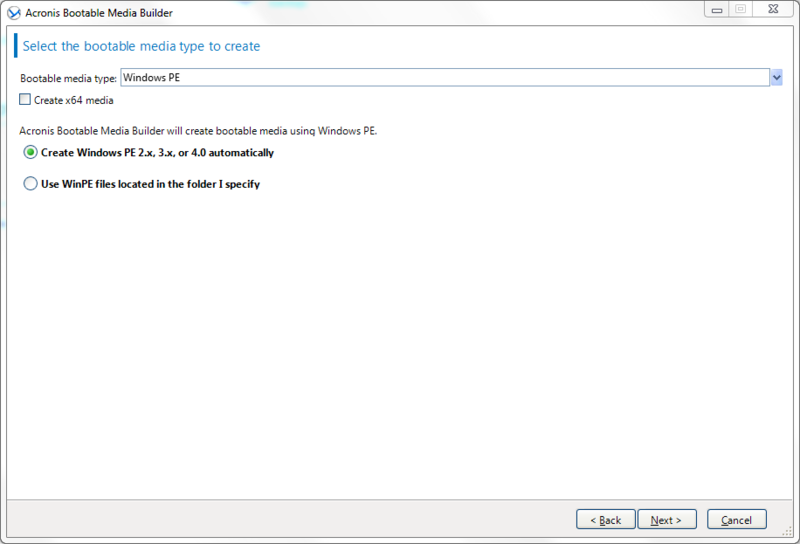 I am using the Acronis Bootable Media Builder to build a default Acronis WINPE boot disc and then try to copy how Acronis runs and incorporate the same method into a .script for Win7PE_SE. I am hoping one of you amazing smart creative members of the reboot.pro community would be able to use the information I've found to create a new AcronisB&R11.5.script. Here is the process I have taken to gather file/registry info. Also to note, \Program Files\Acronis\BackupAndRecovery\trueimage_starter.exe is the main acronis executable to launch acronis in WinPE. here is the winpe32.zip files used in the winpe. Edited by crumpz, 16 September 2013 - 12:20 AM. I have a working Win7pe with Acronis 10.0.11639 on a USB stick. I do not have the project to recreate this, I am trying to copy the working files on to a new Project so that i can update the drivers for local machines i work on. Do you think your method will work for me? did you get a working win7pe working with acronis using your method?